The 2011 ATS International Conference took place in Denver, Colorado, a few weeks ago, and those who took a moment to stop by the SCIREQ booth were rewarded with an opportunity for a live preview of our upcoming multi-subject extension for the flexiVent. The prototype unit on display immediately captured the attention and imagination of our customers and even caused a bit of a stir among some of our competitors. Proof of concept for studying multiple subjects with the flexiVent was provided at ATS 2010 when Robichaud et al. presented a flexiVent configuration that measured Transfer Impedance and obtained individual Resistance and Compliance values for each of two parallel anaesthetized subjects concurrently connected to a single flexiVent system. 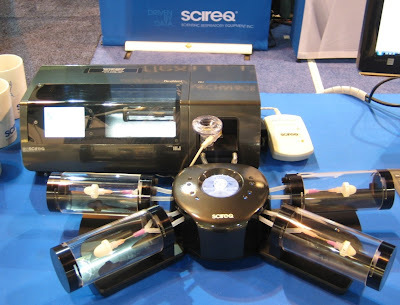 Continuing this project over the past twelve months resulted in the compact, elegant multi-subject extension prototype displayed at the SCIREQ booth at this year’s ATS, where the number of subjects has been extended to four parallel subjects. With the new multi-subject extension, the flexiVent offers distinct study design advantages and greatly increases the efficiency of experimentation. The system will allow you to accelerate data collection and expediently carry out time-sensitive studies, for example when respiratory mechanics measurements must be obtained within a limited time after birth or an intervention. Detailed technical information about this product and additional pictures will be posted here and on our web site as they become available.